Twenty slides om screen for twenty seconds each. Total duration six minutes and forty seconds. The end. 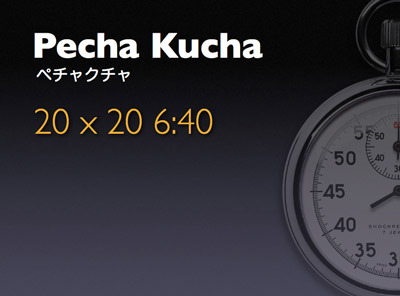 That’s the principle of Pecha Kucha, which started in Tokyo four years ago. To put it another way, at a normal speaking speed, that’s a thousand words with twenty illustrations. Lists of bullet points are out. Complex detail is out. Unrehearsed meandering is pitilessly visible. It’s more important to deliver the right presentation than to be forced into rigid compliance with an arbitrary set of constraints, but as a way of forcing a focus on both the substance and the style of a core message, it has some very clear power.